Rep. Alexandria Ocasio-Cortez says in a new video that U.S. border agents are putting children in cages and injecting them with drugs because they’re not Americans. 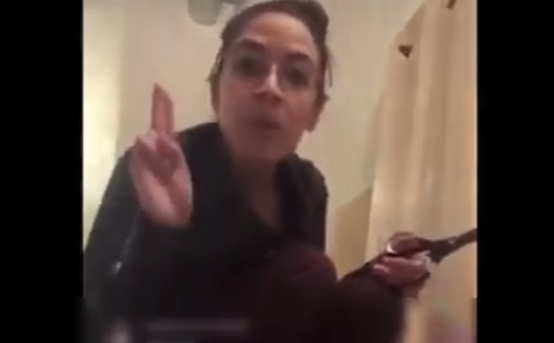 The really weird short video shows the New York Democratic socialist crouching down in a hallway holding a pair of scissors as she does a live stream on Instagram. A longer video shows AOC saying, “I’m in this to do the most good each day. That’s what I’m here to do. So,” she says, then stops and shrugs. “That’s what it is.” She stands up and walks away from the camera, then comes back: “And guess what? I’m 29! I’m the youngest woman to ever be elected to the United States Congress. I have plenty of time to learn. And I’m not afraid to make mistakes and iterate in public either. “And frankly, if the mistakes that I’m making are just a one-off, like, rhetorical thing, you correct it, acknowledge it, and move on.” Then she makes the claim about U.S. Customs and Border Protection agents caging children and injecting them with drugs. So far, the 29-year-old former bartender had made numerous errors, not just “one-off rhetorical” things. She claims that the Earth will be beyond repair within 10 years unless Congress passes her “Green New Deal,” which has an estimated price tag of $93 trillion over 10 years. And when a crazed gunman massacred people in New Zealand last month, she blamed the National Rifle Association somehow.